If you’ve followed us, you’ll know we’ve been keeping all eyes on Korean artists 펑크버스터즈 PunkBusters since we spotted them last year. It seems the resin standing versions are finally ready for sale and the first three characters from Retro Punk Rock figures will be JAMES x BEER x SKULL. The three standing editions will be ready to hit Hong Kong and will be available at Summer Soul 2018! Yeah, we are a tad jealous as we can’t make it to the show. But we can’t be salty as 펑크버스터즈 PunkBusters have announced an online release very soon. We’ve loved them since we first laid our eyes on them back in September 2017 HERE. The first off to the production line will be the resin figures, and Beer, Jack, James, Skull and Mac from the 펑크버스터즈 PunkBusters all get a resin production release. 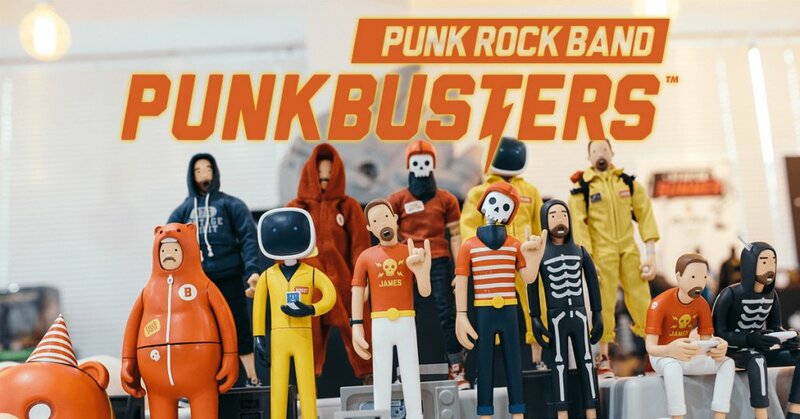 PunkBusters certainly caught our attention as we love McBess and SML/Superfiction plus the Punk Rock was the icing on top. Now with both action figures as well as resin art toy on the horizon we’re getting a little excited down below. Check out the LIVE stream below to see what we are banging on about if you don’t know already. Stilling pose coming soon too! Don’t worry the action figures will also roll out in the near future as well. Stay tuned for general sale and pre-order. Find PunkBusters on www.punkbusters.co.kr Facebook and Instagram.